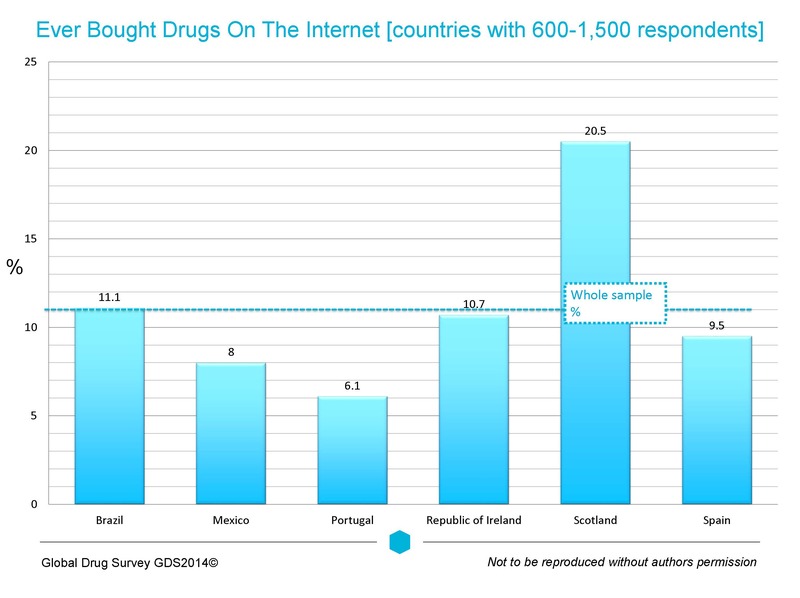 The 2014 Global Drug Survey (GDS2014) conducted during November / December 2013 was the biggest survey of current drug use ever conducted. Published in 8 languages and promoted through media partners in 17 countries, it received almost 80,000 responses. The results from each participating country will be released exclusively through our media partners on April 14th 2014 along with some key global comparisons that our outlined here. Participating countries included USA, UK, Australia, Germany, France, Republic of Ireland, Scotland, Belgium, The Netherlands, Denmark, New Zealand, Hungary, Spain, Portugal, Switzerland, Mexico, Slovenia and Brazil. Below are highlights of the findings from the 2014 survey, including downloadable PDFs, shareable graphics and videos from our YouTube Channel. The self-nominating sample were typically in their in 20s and 30s, well-educated, and about 50% went clubbing at least 4 times a year. The major methodological limitation with such studies is the sampling bias and the variation in size of the samples from different countries. The likely representativeness and precise composition of the samples from the different countries did vary significantly in a number of ways including mean age and involvement in clubbing. This means caution must be used when comparing data between the different countries. But as group they had many things in common. They tended to have higher lifetime prevalence of illicit drug use (over 85%) than the general population and one suspects a greater interest in the topic, but only about 60% had used an illicit drug in the last year, most typically cannabis. Whilst alcohol, tobacco and cannabis remained the most common drugs used within the last year, with cocaine, amphetamine in its various forms and MDMA frequently just behind them, countries showed marked variation in the use of other drugs. The increasing uptake of other preparations nicotine containing products namely shishas tobacco and electronic cigarettes demonstrate the pervasive presence of diverse nicotine based products in our culture. The high rates of caffeine energy drinks, caffeine tablets (and in some countries like Germany even intranasal caffeine) demonstrate the market for this legal stimulant is as strong as ever. Prescribed and non-prescribed psychoactive medication particular opioid painkillers and benzodiazepines were frequently in the top 10 drugs used by GDS populations in the last year, with their use, non-medical and problematic use being particularly high in the USA and New Zealand being dominant forces. Other medications that crossed over into the recreational drug scene such as GHB, methyphenidate (Ritalin) and ketamine were more sporadically distributed. Drugs prices varied widely – the average price of gram of high potency cannabis being 12 euros but varied almost fourfold from 6 euros in Spain to over 20 in Ireland. Cocaine remained the most expensive drug at mean global single gram purchase price of 100 euros / gram (ranging in price from 50 in parts of Europe to over 250 in NZ, which also had the most expensive MDMA as well). Regardless of price, cocaine was voted the worst value for money drug in the world, with a mean score of 3.4/10. MDMA was voted the best value for money drug in the world. The Belgians were the most satisfied with their cocaine with a mean rating of 5.5/10 and the Australians the least with rating of 2.2. 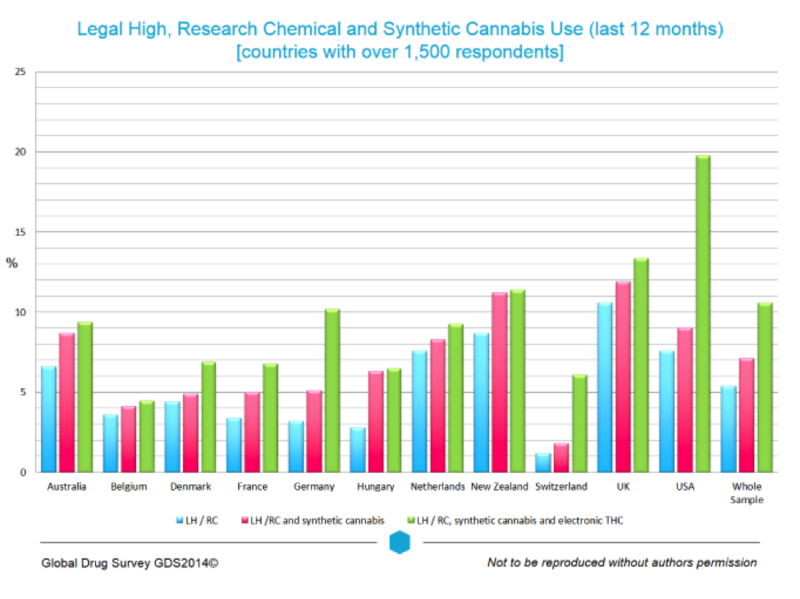 The use of ‘research chemicals and legal highs (including substances sold as bath salts, and synthetic cannabis products) varied widely between countries. 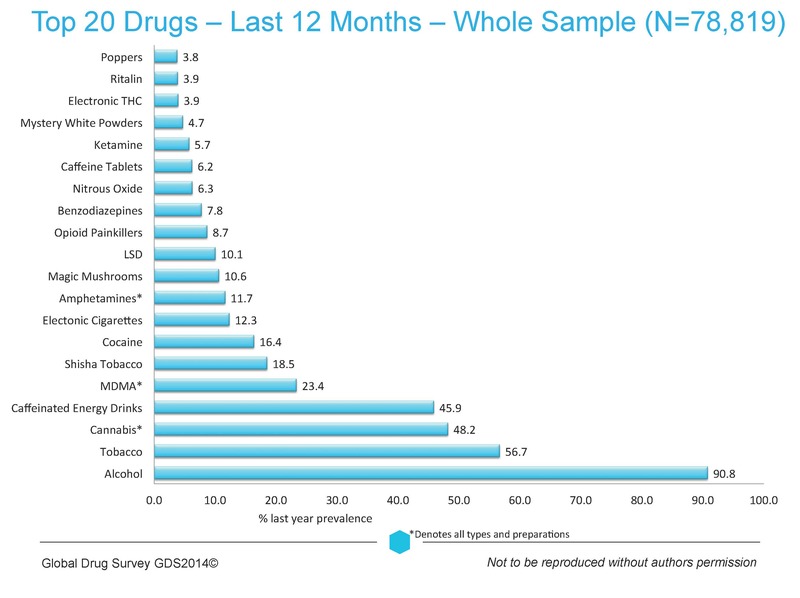 The biggest users were those in USA with over one in 5 having used one of these compounds in the last year. 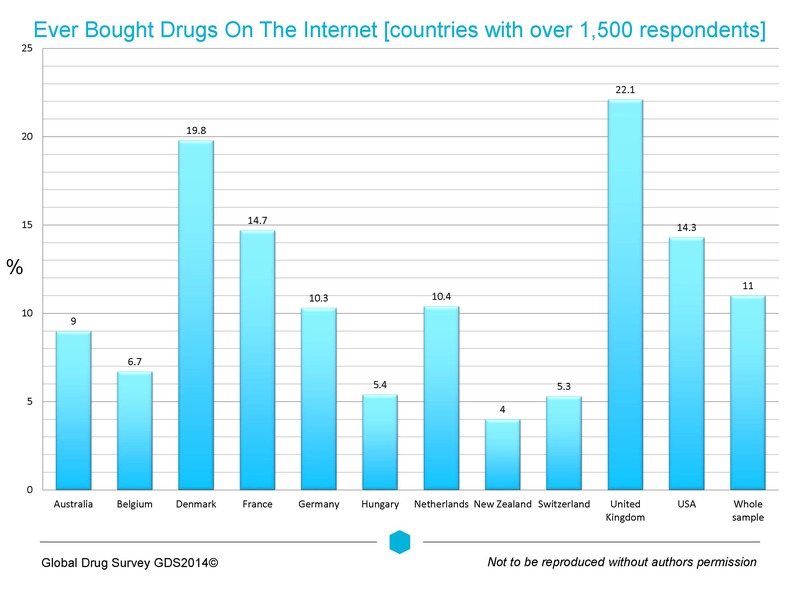 From the data below it appears the rise of electronic THC products make a huge difference to how the use of these drugs maps out across the world with Switzerland, Germany and the USA being early adopters. However the addition of this group of substances blur the picture and excluding them leaves us with the UK and New Zealand as the biggest users. Alcohol remained the biggest cause of concern among friends and the biggest culprit in sending people to Emergency Department. The percentage of last year drinkers who had sought emergency again varied widely from an average of just 1%, to 0.7% in France to over 2% in Ireland. Awareness of national drinking guidelines was universally poor with over 40% of drinkers being unsure of their countries drinking guidelines. The Germans were most clueless with 65% being unsure of them, the Danes the best informed with only 8% reporting they did not know them (that did not stop 1.5% of last year Danish drinker seeking emergency medical treatment following drinking last year). The most universal finding for all drinkers however was the huge level of normative misperception among the heaviest drinkers. Previous work conducted by GDS has shown that normative misperceptions about alcohol use (believing your alcohol use is less than the average) is a predictor of higher levels of alcohol use. There is also a significant association between AUDIT score (see below) and the size of normative misperception with heavier drinkers having larger normative misperceptions. Using the World Health Organization Alcohol Use Disorders Identification Test (AUDIT), GDS2014 found that about 1 in 4 drinkers who scored 20 or more on the AUDIT (suggestive of dependence) thought their drinking was average or less than average compared to others (it was over of third among British and Danish drinkers and lest at about 17% among Swiss and Belgian drinkers). Of all those scoring 20 or higher on the AUDIT, less than 60% accurately identified that their drinking was placing them at high or extreme risk of alcohol related health problems. Heavy American and Australian drinkers (AUDIT scores 20+) had the most insight into the harm their drinking placed at (over 70%), with the Portuguese the least (less than 15%). That 80% of the world’s drinkers were interested in knowing how their drinking compared to others. supports the use of the free on line and smart phone app the Drinks Meter at www.drinksmeter.com and the app stores. The rates of seeking emergency medical treatment for other drugs other than alcohol varied widely. Further research is required to determine the factors that underlie the 3 fold difference in seeking emergency medical treatment (EMT) following the use of MDMA between Switzerland with the lowest rate of seeking EMT (03% of last year users) and the USA, The Republic of Ireland and France (09.1-1%). 2013 saw more press coverage about ecstasy related deaths in the UK than there had been for years. Was it PMA? Was it bad ventilation and dehydration? Was it deaths to weird and wonderful novel psychoactive drugs (aka legal highs)? The 400% rise in deaths due to ‘legal highs’ highlighted in the NPSAD report released in early 2014 has been roundly dismantled as simply inaccurate reporting of data by Professor David Nutt and Dr Les King in the Lancet recently. Deaths due to PMA appear genuine, but rarely was PMA the only thing taken, with MDMA and alcohol usually being present. So is there any other evidence apart from media speculation and uncertain data reports that taking pills in 2013 was associated with more harm than in 2012? I think so and that is the almost 3 fold increase in those seeking EMT following the use of MDMA in the UK (from 03% in GDS2013 to 0.8% in GDS2014). I am not sure why this happened. Twice as many people reported taking powder than pills, over half has also used alcohol. I think part of the explanation is people not knowing how to use better quality MDMA and dose in a way to minimize risk. Our drugs meter minutes on pills and powders and safer use of new drugs talks about these issue clearly. The Global Drug Survey High-way Code ‘the guide to safer more enjoyable drug use’ voted for by almost 80,000 people from across the world highlights that common sense and social responsibility can go a long way in reducing the risks of harm while impacting little on pleasure. Our findings also suggest that cannabis may not be harmless in the short term for everyone who uses it, with an average of 0.5% of last year users seeking EMT. Again wide variation between countries was seen, the highest rates being in Germany where a similar proportion of last year user of cannabis sought EMT as drinkers (1%). In the USA it was 0.2%. Synthetic cannabis products, which remained the most commonly used novel psychoactive drugs across our sample, continued to be associated with be high rates of last year EMT seeking. Compared to traditional cannabis research by GDS estimates their use is associated with a 30 times higher risk of seeking EMT. Rather surprisingly, the highest rates of seeking EMT amongst last year users of synthetic cannabis products were seen in New Zealand (one in 30 last year users) where the products are regulated. Now of course many factors determine whether or not a person seeks EMT following the use of a drug but there may be important lessons to be learned from comparing the patterns of use and consequent harms in different countries. Our finding suggests that regulation does not necessarily reduce drug related harm. Rates of tobacco use amongst our sample was high and although over half of all tobacco smokers expressed a desire to use less or stop and many wanted help to stop, only a tiny minority reported using forms of nicotine replacement therapies (NRT) to help them smoke less. This is a missed opportunity, since the use of NRT is not only associated with reduced tobacco use but can double the likelihood of a successful quit attempt. The migration of shisha tobacco use beyond its once tightly confined geographical boundaries accompanied the rise of electronic cigarettes though there was wide variations in the prevalence of their use between countries. Anyone thinking e-cigarettes herald the end of tobacco smoking will be dismayed that only 10–20% of those who had tried them reported they had either stopped smoking altogether or had significantly reduced their consumption. Such a modest reduction however may still have significant population level health impacts and any judgment about their regulation will have to be weighed up against the risk that diminished access will have upon use of what appears to another exit route off a fatal addiction. Our huge study of over 38,000 cannabis users showed that the USA was home to safest smokers – with only 7% choosing to smoke cannabis with tobacco followed by NZ (25%) , compared to over 80% of smokers in most other countries. Although the most sensible cannabis smokers, the USA was the worst place to get caught with cannabis with over 17% reporting that it impacted on their education, employment, and travel. Our section defining the ‘perfect cannabis’ showed that the global dominance of high potency herbal preparation leaves many users far from satisfied. Despite high potency forms typically being rated the most potent and preferred form of cannabis across the globe, such forms were not without significant shortcomings. Memory, paranoia, impaired ability function, feeling uncomfortable when talking to others, distraction, the munchies, the urge to use more, restlessness, hangover effects, and harmful effects on the lungs were all aspects of the ‘stone’ on hydroponic / high potency preparations they users wanted less off. Users indicated they wanted more sensory perpetual enhancement, more giggling, improved taste, stronger cannabis and an overall 25% increase in pleasurable effects. Looking at the results there does appears to be a paradox in the way people describe their perfect cannabis. This is because most of the effects of being ‘high’ are due to THC but higher doses of this drug are associated with more negative psychological effects. So while people describe wanting a preparation with overall more pleasurable effects, that is stronger, more relaxing, with greater sensory perceptual disturbance and enhanced ability to function they also describe wanting less of the negative effects that are also due to THC such as sedation, munchies, memory impairment, restlessness. It might well be what they are describing is a high potency THC containing preparation balanced by CBD which is missing from many current strains. Further analysis of our data should help us identify the ‘perfect weed’ and hypothesize what the balance and precise % of THC and CBD should be for the ‘perfect stone, ‘more pleasure, less unwanted effects’. We know that different people will of course have their personal preferences but it will be an interesting exercise. It remains to be seen whether regulated markets such as those appearing in Colorado will allow the development of more balanced preparations and of course the promotion of healthier forms of use such as vaporizing and the avoidance of tobacco. Finally among all illegal drugs, cannabis was the drug that most people wanted to use less of and help with in reducing their use. This confirms that for some users (perhaps 10-20%) cannabis can be associated with problems. For many dependent users, withdrawal on stopping will also be an issue with sleep disturbance, weird dreams, irritability, restlessness and craving being the major problems. www.drugsmeter.com is worth checking out. Since drinking and using drugs is part of people’s daily routine, it’s not surprising that occasionally different parts of people’s lives like work and pleasure overlap. Turning up to work hung over or coming down from the effects of drugs was common among the GDS2014 sample, with over one third of those in work reporting going to work hung-over – but less than half of that number reporting going work coming down from drugs. Can safer drug use be more enjoyable? Finally the Global Drug Survey 2014 identified perhaps one of the most significant and practically relevant findings of the last 5 years of its work. Strategies adopted by people who use drugs to reduce the risk of harm also appear to have either a neutral or positive effect on the pleasure they get from that drug. Safer drug use is more enjoyable drug use. Adopting safer drug using practices can reduce drug related risk. The full list of strategies adopted and rated by almost 80,000 drugs users from across the world on 8 of the most commonly use drugs have been published as a collection of guides known as the High-way Code. Such a guide – with strategies put forward but drug users and other drug experts has the potential to save lives, reduce emergency medical service utilization and promote healthier less harmful drug use. Accepting that many of the harms related to drug use can be significantly reduced by how you use your drugs, where you use them and what you do while you are under the influence, means that as a society we can promote safer use and reduce risk. What is different about the High-way Code is that not only was it was voted for by people who use drugs but that as well as rating strategies on their impact in reducing the risk of harm, they also highlight the impact of the same strategies on the pleasure obtained from using the drug. Given that the major driver for drug use is pleasure, not reducing risk we think this is important. Being able to say that safer drug use is more enjoyable is a bit like saying you can lose weight and eat chips and pizza. The significance of these finding for governments need to be taken in conjunction with the predominant finding from Global Drug Survey’s hypothetical questions about how reducing the criminal penalties for the possession of small amounts of drugs would impact upon people’s drug using behaviours, for more on this see our recent blog post. The overwhelming finding across countries was not that a reduction in criminal penalties would encourage hoards of non-drug users to try drugs or for current drug users to increase their use. Instead it was that people who use drugs would be more open with their family and friends about their use and more likely to seek help or advice about the use and associated health harms. Government drug policy should not be caught up in a polarized debate about legalization but instead should consider crafting a public health policy that optimizes the health and well-being of all its citizens. The first step is to treat people who drugs as rationale adults who wish to be informed and have a strong desire to preserve their health and happiness and contribute to their society as much as the person next to them. If changing drug laws reduces societal harms and promotes health among those who drugs and leads to a happier, more productive society with less discrimination and compounded deprivation of the most vulnerable then surely change is worth considering with objectivity and evidence. Any other outcome would appear to be made by someone who was off their heads on drugs!